The Grand Renaissance Dam or GERD. Kifle Horo, former head of the Grand Ethiopian Renaissance Dam, has been named the new chief engineer of the project, replacing the position held by the deceased Simegnew Bekele. Ethiopian Electric Power, the owner of the project, appointed Kifle to head the 4.8-billion-dollar project effective October 3, 2018. Kifle has been serving at Ethiopian Electric Power as a consultant and advisor for project management. He has three and a half decades of experience in the power industry. He replaces Simegnew, who headed the project for eight years until his death in an apparent suicide in July. He was found shot in his car at Mesqel Square, in Addis Abeba. In the interim, Ephrem Woldekidan has been serving as a manager leading the construction of the Renaissance Dam. Ethiopian Power also assigned Fekadu Kebede and Ephrem as deputy managers, according to a statement by the company. Kifle obtained his first degree from Addis Abeba University in Electrical Engineering and completed his Master's degree in project management from the University of Salford, United Kingdom. He has also taken advanced professional training in electrical maintenance at Schmalkalden University of Applied Sciences in Germany. He started a career that spans 34 years at Ethiopian Power, where he was first employed in 1984 as a junior engineer at the former Ethiopian Eclectic Power Corporation. He rose through the ranks until reaching his new appointment as project manager of the Renaissance Dam. Eight years ago, he was appointed to head the civil engineering work of the dam, while Semegnew was in charge of overseeing the electromechanical work. Before he moved to the Renaissance Dam project, Kifle served for four years as the project manager of Beles Multipurpose Project. "He was very successful in managing the Beles project," said a colleague who worked with him. He worked at the Renaissance Dam for a brief one-year period before he was switched to another assignment to coordinate projects of Ethiopian Power financed by the World Bank and African Development Bank. 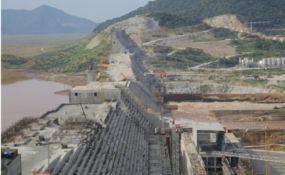 Ethiopian Power relieved Kifle from his post at the Renaissance Dam following a disagreement with Metal & Engineering Corporation (MetEC), the government conglomerate, contracted for the electromechanical and hydraulic steel structure work at the Dam. Kifle and MetEC entered a dispute over issues dealing with design alterations that pushed the power generating capacity of the dam to over 6,000MW from 5,500MW, according to sources close to the case. "He strongly objected to the design revisions," said a source familiar with the case. "This put him in a tense confrontation with MetEC staff." Still under construction by Salini (Costruttori) Construction as a turnkey project, the dam is located 40Km from the Sudanese border in Benishangul Regional State. Salini has worked previously on Gilgel Gibe II (420MW) and the Tana Beles (460MW) hydroelectric dams in the country. Launched by the initiative of late Prime Minister Meles Zenawi, the Renaissance Dam is expected to operate with 15 turbines. MetEC was also contracted to install the turbines and generators. However, it backed off from the project and transferred the responsibility to Alstom, a French company that was originally engaged to supply the turbines. In August, Prime Minister Abiy Ahmed (PhD) revealed his administration's frustration over the delay at the dam project and raised concerns about the role and efficiency of MetEC in the project. "The country was supposed to complete the dam within five years, yet seven or eight years later the country cannot make a single turbine operational," he said. MetEC is undergoing a split into separate commercial and defense entities. The conglomerate took in 16.79 billion Br in payments from a 25.58 billion Br contract, 66pc, while only implementing 30pc of the project. The reports also highlighted that Salini Impregilo, the prime contractor at the dam, has demanded compensation for the delays caused by MetEC. Police have also associated the construction delays and payment issues as a cause for Simegnew's suicide. "Our investigation point to the delays and increasing costs associated with MetEC as causes for his [Simegnew's] suicide," said Zeynu Jemal, Commissioner General of Police Commission, when he addressed journalists last month. MetEC was ordered to handover the contract tasks to China Gezhouba Group Corporation and Alstom. The two companies were working as subcontractors for MetEC previously.